New details have been revealed about the in-build 35 metre flagship superyacht of Taiwanese yard Johnson Yachts. 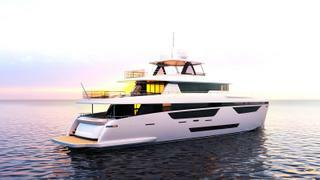 The Johnson 115 was first revealed at the Fort Lauderdale International Boat Show and will be the yard's first tri-deck superyacht. Exterior design comes from boards of Bill Dixon of Dixon Yacht Design while interior design is being handled by Design Unlimited. The design firm has now revealed new interior detailing about the superyacht, which is available in two cabin layout options accommodating either 10 or 12 guests in five or six staterooms. 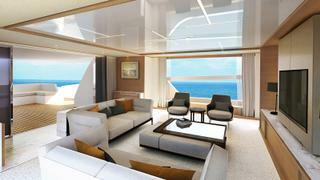 Interior living spaces have been designed to be social and comfortable as well as easily accessible from the deck. The main saloon area will include a formal dining set up juxtaposing with a relaxed lounging area. 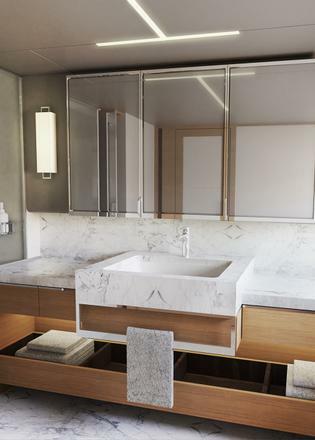 High quality materials will be present throughout in finishes and furnishings customised to the owners' tastes. Design Unlimited founder Mark Tucker said: “The Johnson 115 benefits from our extensive experience in the design of custom superyachts, as well as our production build knowledge." Exterior details include a plumb bow and tri-deck profile featuring large windows, all protected by bulwarks inlaid with glazing. Meanwhile al fresco entertaining spaces will be plentiful, including a skylounge, foredeck area and wide open-air aft deck on the upper level. 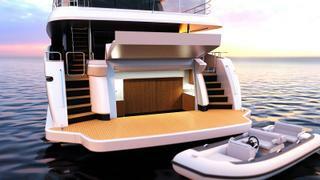 A large hydraulic swim platform will sit on the aft foredeck, while a transom garage will open to reveal a beach club. The swim platform will accommodate a five metre tender. A garage located behind the beach club will also fit a 5.5 metre tender. 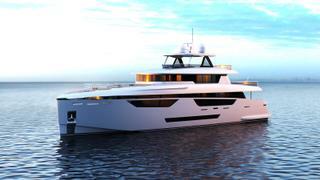 Johnson Yachts president Andy Huang previously stated that the concept showed the yard was responding to market demand. “In recent years, we’ve been getting quite a few inquiries about building tri-deck superyachts. It’s time for us to come up with a stunning new breed of yacht that will fascinate the world,” he said.